Before and After…, originally uploaded by shellipsm. On the left, you see my hair with the EVER present “bump” from my pony tail holder. On the right, my NEW, FABOO DO! I LOVE my “stylist.” When my hair was short short short a few years ago, I discovered this wonderful Russian barber in Chelsea. $15.00 for a haircut, but he’s the only one I’ll trust with my hair. He knows my hair REALLY well, and I basically went to him, gave him a big hug after a 3 year absence, updated him on our lives, and told him to do whatever he thought would be best. Next Next post: C is for Cougie! I commented on Flickr, but wanted to say how much I love it! It really is a great cut! What was the reaction from Narda and Malka??? You look wonderful, Shelli!! Way to go! Will be so much easier to care for now. oh it looks awesome!!! it’s practically cheaper for me to hop a train and come to NYC to have it done by him than it is to have it done by our regular guy (which is why it’s been MONTHS since my hair has been cut. sigh). Love it! Very hip. You are one cool mama. 🙂 I am growing mine out (Sister’s wedding in June) and I *hate* mine. Lovely darling just lovely… and now that you have all those beautiful curls… have I got the hair products for you! We’ll talk girlfriend. Hehe. VERY lovely! It really shows off those amazing eyes of yours. Beautiful haircut! It’s so flattering! Love the cut! So jealous! 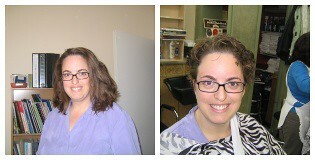 I recently made the hellish mistake of making a Huge Change in my hair with a new stylist so I could save a few bucks. I’ll leave the rest to your imagination. Learn from my mistakes, people! Pay the money and let someone new maintain the new ‘do! PS, what is it with all the bloggers I read getting their luscious long locks lopped? And did Certain People react okay or freak out?